With our combined Sheridan and Eagan Irish ancestry one would think we would be serving up some corned beef and cabbage for tomorrow night’s St. Patty’s Day feast. Nope. We love the idea of that traditional Irish dinner but unfortunately, neither of us like it very much! In the past we’ve celebrated with Guinness bbq chicken or Guinness braised short ribs Tomorrow, we’re serving up another Guinness flavor infused dish. Very easy and very flavorful! 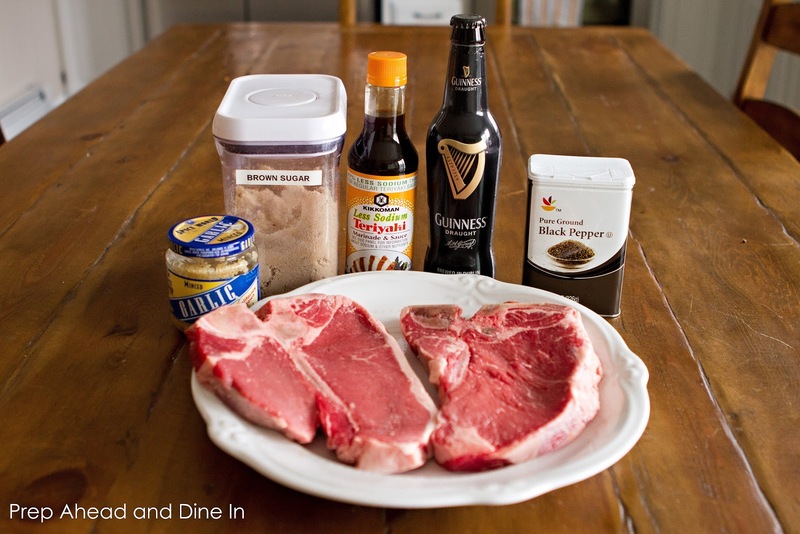 Sweetened Guinness and teriyaki grilled steak! Prep Ahead Plan: Combine all ingredients in a Ziploc bag either the night before or 6-8 hours before grilling! Marinate in fridge! 1. Combine everything except for steak in a bowl or large Ziploc bag. Mix well. 2. Add steak to marinade, moving it around to make sure the marinade is all over the steak. 3. Refrigerate overnight or for 6-8 hours. 4. Grill over medium-high heat on a covered grill 3 to 5 minutes per side for medium doneness depending on thickness of steak and how you like your steak cooked! Copyright © PrepAhead and Dine In: Sweetened Guinness and Teriyaki Grilled Steak. All Rights Reserved.